Scientists have announced a breakthrough in stem cell research that could have major implications for medical treatments that involve regenerating human cells. And their discovery came from an unlikely source: royal jelly. It’s the same substance honey bees use to turn a common bee larvae into a queen. A queen bee starts her life just like any other bee – a larva in the honey bee hive, taken care of by her siblings. But when it’s time for a new queen, this larva is pulled aside and fed copious amounts of royal jelly, a nutritious goop secreted by the hive’s nurse bees. This, rather than any genetic differences, is what makes her a queen. This queen bee grows larger than the other bees in the hive, which means she ends up with substantially more cells in her body, despite being genetically similar to her sisters. Royal jelly is thought to increase her cell count by somehow triggering an increase in stem cells — cells that haven’t yet differentiated into specialized cells — early in her development. Royal jelly is popular as a dietary supplement in many areas of the world. Though many of the claimed effects on human health are of dubious merit, a few have been supported by randomized controlled trials. 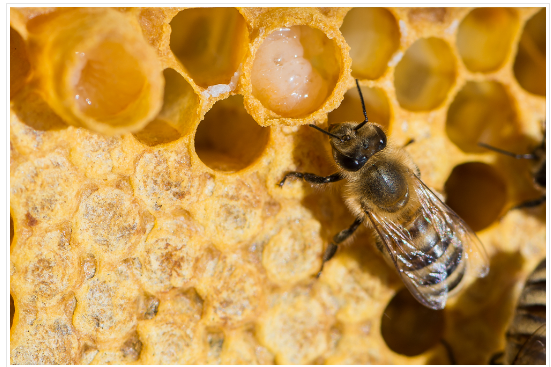 The latter inspired researchers to examine what effects the jelly might have outside of a bee hive. Now, a research team out of Stanford University has found that the active compound in royal jelly, royalactin, prevents stem cells from differentiating, or growing into mature versions of, say, muscle or skin cells. This means that as they continue to grow and multiply they create more stem cells, increasing their therapeutic potential.